You consider yourself a pretty responsible parent. You make sure your children eat the healthy stuff, wear a helmet when riding their bike, and look both ways before crossing the street. You even monitor their computer, smartphone, and/or tablet use, setting time restrictions and downloading rules. As thorough as you try to be, though, there will come always come a time when something slips through the cracks. Thankfully, programmers and designers try to anticipate such slips and provide us parents with built-in safety measures to help us keep our kids safe. 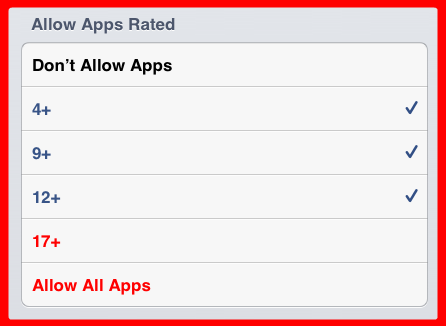 By now, you are probably very familiar with the rating system for apps available for your iPad. 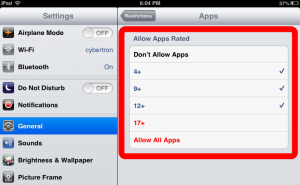 However, did you know there is a setting on your iPad that will prevent your child from downloading an app if its rating is higher than what you allow? 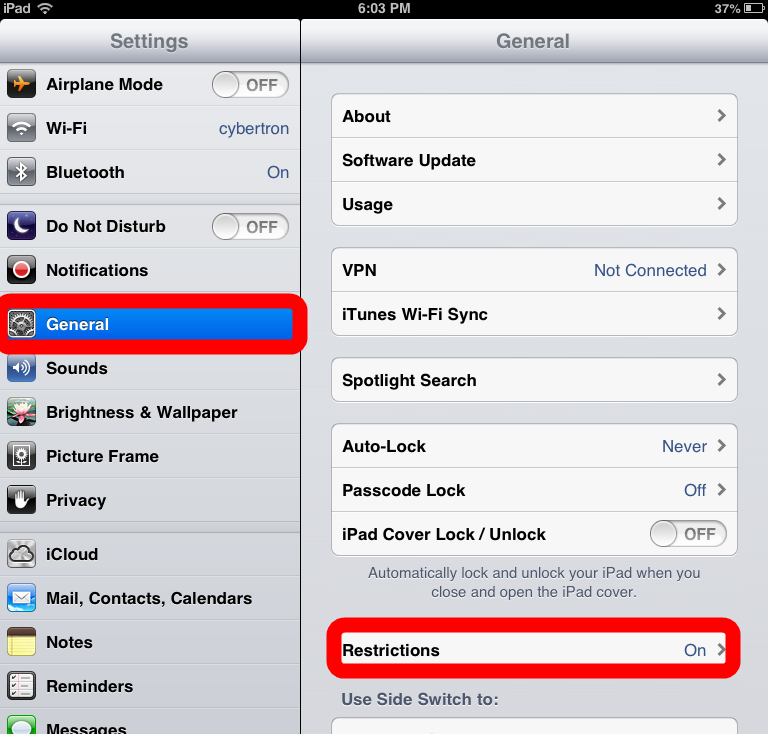 You will be prompted for a passcode, assuming you have already set up restrictions. If not, choose Enable Restrictions and set a 4-digit passcode using a number sequence that you will remember but your kids will not be able to guess. 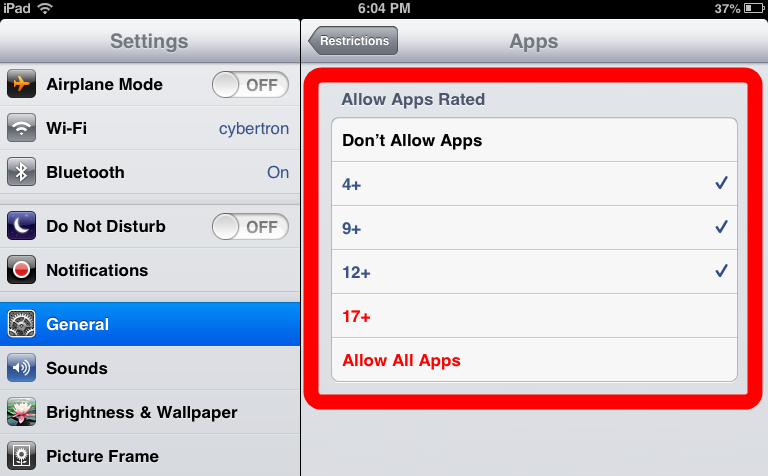 The Allow Apps Rated box will appear on the right. Tap the highest rating you want to allow for download. If the rating is in red, it will not be allowed. 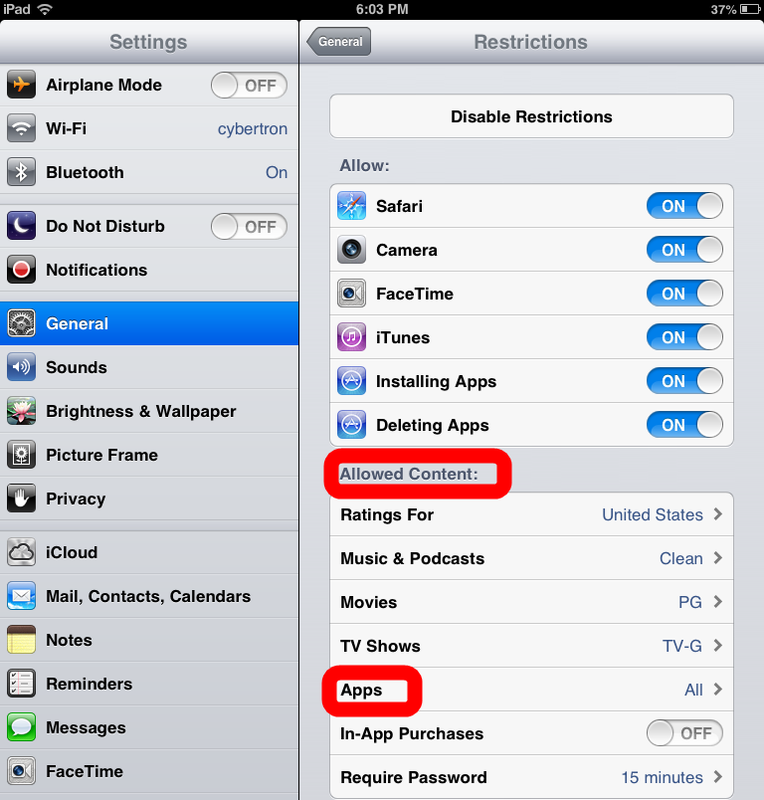 A couple things to note: These steps only prevent your child from downloading apps based on their rating. They will still be able to see all the apps in the App Store but will be unable to proceed with the downloading process if the rating is higher than what you set in the Allow Apps Rated box. 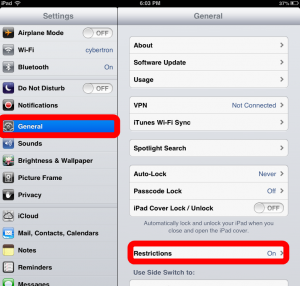 Also, once you have set your restrictions, you may find apps missing from your home screen. 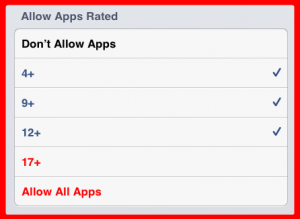 Apps with ratings higher than your set restriction will no longer be accessible. Downloading new apps is a frequent occurrence in households across America. With more than 500,000 apps available, there is no shortage of content out there to meet the educational and entertainment needs of our kids. 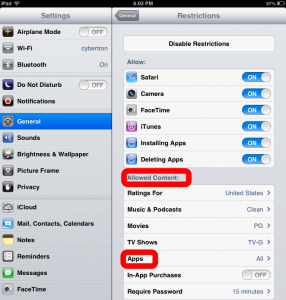 With this rating-based restriction in place, you can breathe a little easier knowing that your child will not be exposed to any age-inappropriate content on their iPad.